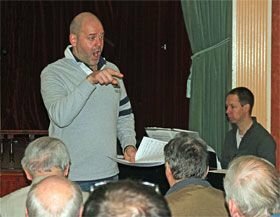 The new musical director of Rhos Male Voice Choir has said he wants to take the choir to new heights. James Llewelyn Jones conducted the choir in a concert for the first time this weekend (20th March 2016) at the Minsterley Eisteddfod in Shropshire. He takes over the choir which is now widely acknowledged as one of the best of its kind in the country. “It is a great honour to be asked to lead the Rhos Male Voice Choir. I have watched the choir’s progress under Aled Phillips in recent years. They are an amazing choir and have achieved great things. I hope that we can progress to even greater heights." 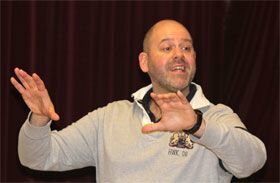 “We have had several years of outstanding success both in concerts and competitions under Aled Phillips and we are very fortunate to have as our new MD James Llewelyn Jones – from the first time he came and spent time with us at a rehearsal the choir were unanimous in wanting him to take over the reins. He is an accomplished musician with a great understanding of the culture of Welsh male voice choirs. Aled Phillips stepped down as musical director of the choir last summer after winning the male voice choir competition at the Llangollen International Eisteddfod in July. James Llewelyn Jones was born in New Zealand and raised in Montgomeryshire. He was, for many years, bass section leader of the National Youth Choirs of Wales and Great Britain and a founder member of the National Chamber Choir. He was also a member, and later a tutor for the Four Counties Youth Choir and sang for many years with the Cantorion Sirenian Singers based in Wrexham, whose inspiring musical director Jean Stanley Jones introduced him to the works of local composers Sir William Mathias and Brian Hughes. He studied in Birmingham where he gained his B Mus (Hons) and M Mus degrees with distinction. also the conductor of Canzonetta Children’s Choirs of Manchester – formally the internationally acclaimed Manchester Boys’ choir. Since 2006, James has been the Musical Director of Canoldir, a Birmingham-base male voice choir. He has also worked abroad in America, Australia, Canada, Czech Republic, France, Hungary, Ireland, Italy, Poland and New Zealand. James has recently been invited to become a Choral Clinician and workshop leader for the National Association of Choirs. Singers between the age of 8 and 80 were on stage at Rhos’s Stiwt Theatre on Saturday in a special concert for St David’s Day. And among the 400-plus audience were a couple who had travelled from Wisconsin, USA. 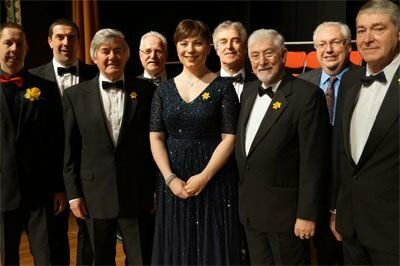 The Rhos Male Voice choir concert featured Côr Bechgyn Rhos (Rhos Boys Choir) and the choir from Ysgol I D Hooson, as well as talented Welsh soprano Natalya Romaniw. Choir members with acting musical director Kevin Whitley (Far left) with soloist Natalya Romaniw (Centre) and compere Aled Lewis Evans (Back right). Marty and Miriam Marriott are visiting family in the area and went to the concert to see their grandson Robert Williams singing with the Ysgol I D Hooson choir. The boys' choir performed a new song written by conductor Aled Phillips about a Welsh dragon from Ponciau called Merlin. The choir from Ysgol I D Hooson sang four Welsh songs including Cadwyn For and Joio Yn Y Jambori. Mrs Heulwen Williams, conductor of the Hooson choir, said the children had really enjoyed performing again at the Stiwt. Compere Aled Lewis Evans said the concert had been a memorable celebration and paid tribute to the talents of all those taking part.